We were asked to design an extension to a Victorian villa to open-up the kitchen to the garden, making places for cooking, dining and sitting. A range of sheds blocking the garden from the house is cleared away. The back of the house is propped on steel to open up a corner. Three changes in level from house to garden are consolidated in one place to make sitting steps. 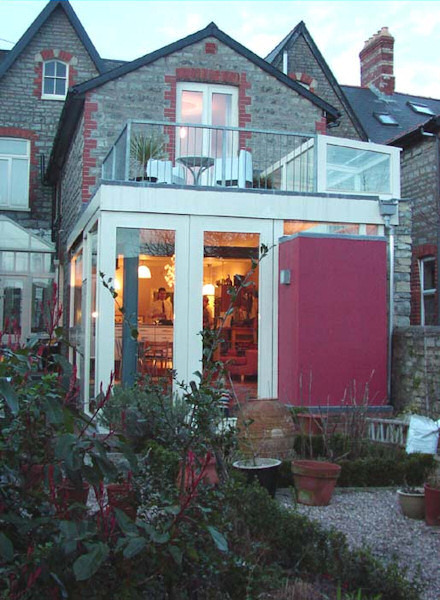 A roof terrace is introduced on top of a small extension, which allows gives the house new views across to the Holm Islands in the Bristol Channel. The point was to make a series of places tailored around use, which suggest to people how to imagine and re-imagine them. The first inhabitants were two adults, two children and two cats. The room was conceived always with them in mind, the scheme re-worked in conversation to get the best fit of people and building. One of the main ways that people make places their own is by the simple business of setting things, or themselves, down. Ledges are good for this - they make spaces into places - and big steps make lots of ledges. Here, there are plenty of ledges. A pit has two sides with sitting steps at different heights. Another ledge makes a catwalk to the cat-flap. Ambiguous high ledges suggest places to display things. Extra-wide glazing beads also make little ledges, particularly for children's games. It's good to cut materials so that they show off their grain. The corner column, which needed to be offset from the doors to make the corner properly apparent, could have simply oversailed the beam, bolted to it with an angled bracket. Instead, it was cut at 45 degrees and re-welded to make a little shelf for the beam to sit on. This catches a little bit of sky between mitre and ceiling and shows-off the fine arrises of the cut steel. The same fascination with showing-off the fine edges of steel sections (isn't it astonishing that something so thin has so much strength?) also helped design the haunches on the 'goalpost' which supports the existing first floor wall. These could have been conventional triangular haunches but, instead, a cruciform of flat-plates sandwiched between two other plates was welded-up, making enigmatic capitals with little ledges to set things - which the clients spotted when they propped plates in there. Putting little bits of one material into a mass of another help to show it off. Carlo Scarpa did this by putting brass strips on edge into stonework and joinery - which bring out the grain of stone and timber. There's something wonderful about the relentless module of brick and joint which I thought could be shown up by putting-in pieces which adhere to the module but aren't rigidly modular. Like playing Tetris with brickwork. Nine pre-cast pieces, moulded in a concrete mix with Portland stone dust, are put into the brick walls and paving. The greyish-white of the concrete shows off the rich, warm red rubber bricks. The offset 'L-shaped' pieces and corner pieces show-off the bond. Lutyens made an office building on Kingsway in London in the 1910s which had individual three-by-five-inch centre-pivoted tilting quarries fitted into the leaded lights. Each quarry had two tiny hinges; push at the top to open it and the bottom to close. There's a kind of curiosity in putting little things into bigger things. Here, in a fixed panel alongside the dining table, there's a tiny piece of glass between two massive ones top and bottom and between two solid casements left and right. This is at child height indoors and adult height outdoors giving glimpses both ways. There's also a hinged wicket fitted into the large sliding door (which makes ducking-out into the garden more joyful on a grim day). The relative smallness of each of these things gives the bigger elements a sort of intimacy.